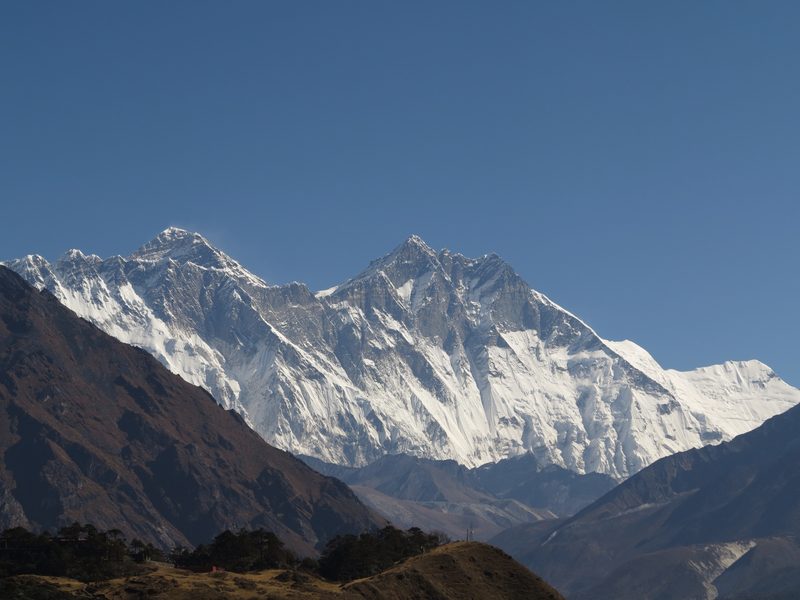 So I've been in the Khumbu region for a few days now and have Internet access, so I thought I'd post an update. 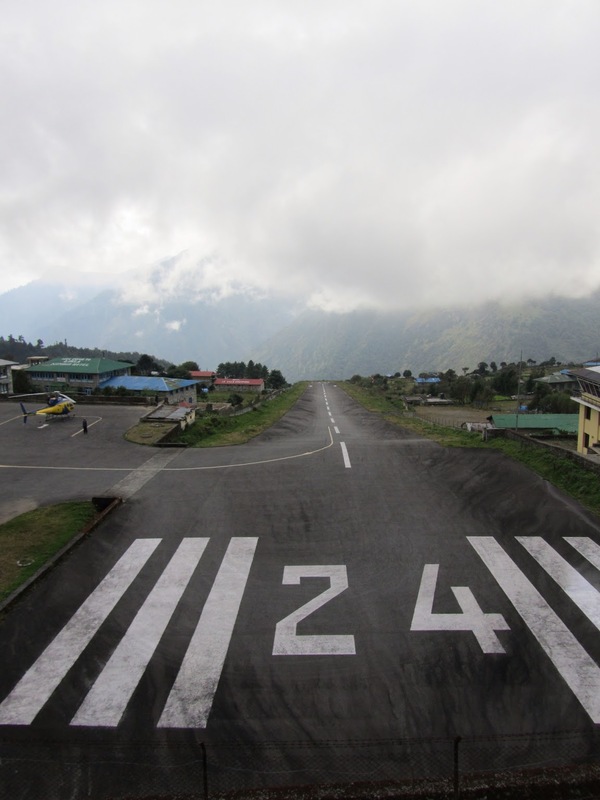 The plan was to get the 9:20 flight from Kathmandu to Lukla and then walk to Phakding. Unfortunately, when I looked out of my hotel window it was cloudy so I was expecting some delays. On arrival at the domestic terminal, I entered the chaos, there were fellow trekkers and locals sitting around on the floor amongst sacks of rice, garlic and onions, it was obvious that not many flights had made it out. Pasang and I loitered around the check in desk waiting for our time to check in. When the desk opened all mayhem broke out. There was no queuing system, instead everyone thrust their booking forms in the faces of the staff. By this time the flights were already running 1.5 hours behind schedule. We finally got checked in at 11:00 and my rucksack was whisked off, then cleared security into departures. My flight was now due out at 12:00 so only 2.5 hours late. Midday came and went and we were told 13:00 then 14:00, eventually at 16:00 we were on the bus to the plane. We boarded the tiny twin otter and I had the seat immediately behind the co-pilot. I stuffed some cotton wool into my ears to dull the noise of the engines. We still had to wait for permission to take off and at 16:30 we were on our way and the little plane roared down the runway and then we were airborne. Due to the weather I braced myself for a bumpy journey, but the pilot steered us skilfully around the clouds and I sat back and enjoyed the view. After about 35 mins we started to descend and after a sharp left turn, I could see the miniature runway of Lukla. The ground was approaching fast, then all of a sudden we we down on the ground. It was one of the smoothest flights and landings I've experienced after all the horror stories I have heard. We later found out that this was the last flight of the day, we collected my rucksack which I hadn't seen all day then off to find a guest house as it was too late to start trekking as it would be getting dark soon. The day was full of waiting around and no trekking, but on the positive side I was in the Khumbu and not in KTM. I was woken at 6:30 by the hum of airplanes landing and taking off from the airport, so went downstairs to have breakfast and then were we're on the trail at 7:30. The path was easy going mainly downhill and surprisingly quiet, I was expecting loads of trekkers. After 1 hour 40 minutes we walked through Phakding, Pasang was amazed as this normally takes 3 hours, we were not going fast but at a steady pace. We had a quick tea break then we crossed the Dudh Khosi River and started the steady climb up to Monjo. Arriving at 11:00. We decided to have lunch for an hour. This was meant to be our nights stop, but Pasang thought we could make Namche Bazar in 2-3 hours. We went for it! We entered the Sagarmatha National Park and followed the river , crossing it a few times until we reached the confluence of 2 rivers where we crossed a really high suspension bridge. From here the trail steepened significantly and I was down to a snails pace. After a gruelling 2.5 hours of uphill we entered Namche. I saw a familiar face, it was Gelu from my Annapurna trek who had come to meet us and walk us to the lodge. We arrived at 14:30, so I had been on the go for 7 hours including a 1 hour rest stop. Not bad going considering most trekking itineraries take 2 days to get this far! I think I'm turning part Sherpa. To be honest I was knackered and wanted to go to sleep. The nights are getting chilly at this altitude (3440m) and I glad of my sleeping bag. Even though its a rest day, I was up at 6:30. We were going for a short walk after breakfast up to the Everest View Hotel, some 400m above Namche. The path was steep going at first, until we reached the tiny airstrip at Syangboche (smaller than Lukla if that's possible). 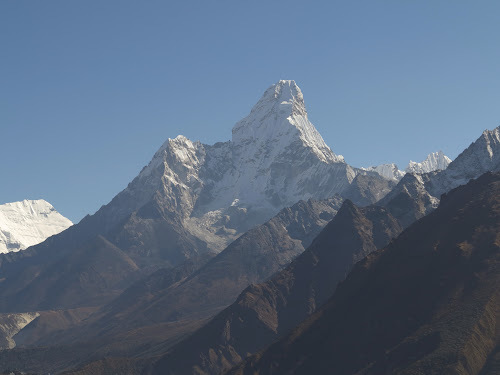 As we rounded the corner I was greeted with the most spectacular clear views of Everest, Lhotse, Lhotse Shar, Ama Dablam & Nuptse. 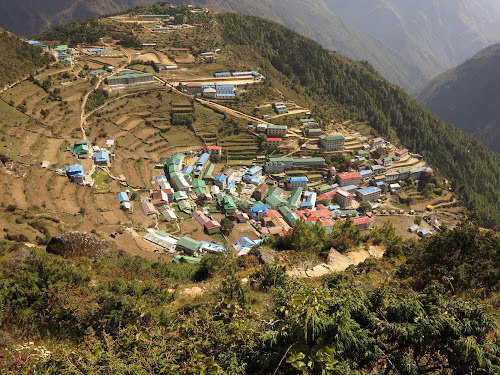 We went to the hotel for a pot of tea and to take some photos, then made our way to the villages of Khumjung and Khunde, this is where there is a small hospital that Sir Edmund Hillary helped establish. It was lunch time and a walcome rest stop, then it was back down to Namche via some evil steps, my knees were shot, and we had been walking for 3.5 hours, some rest day eh!